The caramel from the brown sugar gives this a fantastic flavour. Heat the oven to 160°C/320°F/Gas Mark 3. Butter a 9 inch deep cake tin (preferably not loose-based) and line the base with baking parchment. Mix the milk and vanilla together. Put the sugar and eggs into a large bowl and whisk with a hand electric mixer until the mixture is thick, pale and increased in volume, this should take about 5 minutes. Test it is ready by lifting the whisk blades – if the mixture briefly leaves a trail, you are ready to proceed. Add one–third of the flour and whisk slowly to incorporate, then one–third of the milk and mix again. Repeat twice more until all the flour and milk is added. Slowly whisk in the melted butter. Melt the butter in a small pan and add the muscovado sugar, allow to dissolve for a couple of minutes and pour onto the base of the tin. Next place the apples cut side down in the caramel. Pour the sponge mixture over the top and slide into the oven. 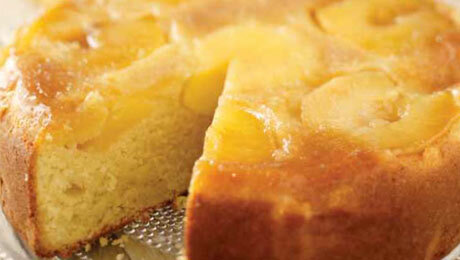 Bake for 1–1¼ hrs until the cake is firm to touch and springs back when lightly pressed. Cool the cake in the tin for 20 minutes, then carefully remove from the tin, peel off the lining paper. Made this last night for the family and it went down a treat. Served warm with custard, really good comfort food. The recipe was easy to follow and turned out exactly right. It would also make a great afternoon coffee addition served in squares as it kept its structure when cut.